"An All New Height in Fright and Might!" The Italian sword-and-sandal film features Hercules, the legendary demi-god who is the son of Zeus and a human woman. Hercules is tasked with retrieving the stone of forgetfulness by an oracle to save his lover, a princess, from losing her mind. Hercules ventures forth and encounters a macabre world full of ghastly creatures. He does battle with them, throwing huge stones at groups of zombies in order to defeat them and find the stone. He encounters the lord of the zombies, and demands the stone to save his beloved from the depths of her madness. The film contains suggestive situations. 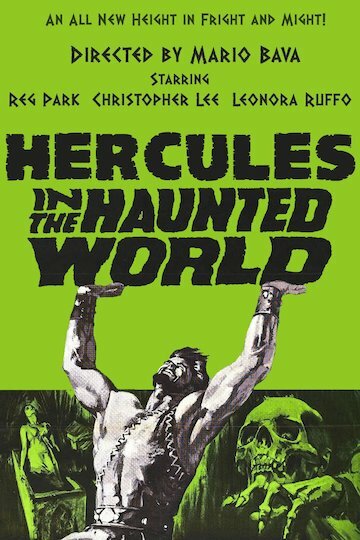 Hercules in the Haunted World is currently available to watch and stream, download on demand at Amazon Prime online.